Looks very nice ! Maybe this will convince me to finally play this game. I love FE very much, but the pre-GBA games look a bit austere to my taste. 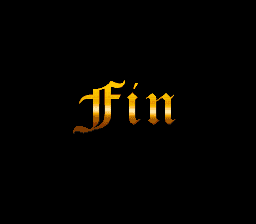 After this finished, going to the Thracia 776 if you have a time. This might be a long post sorry! 1) how's everything been going on Project NAga. I've been away and haven't been able to keep up. Hope everything's good! 2) this is probably stupid but on the ced speed glitch, can the Holsety Tome impact fixing the glitch? My buddy does some coding and patching and while he hasn't looked at FE4, I have told him about it and mentioned the Holsety Tome and he wasn't sure but wandered if the Tome could some how fix the glitch since it seems that the glitch is triggered when Lewin and his partner have max speed. Again probably dumb and won't work but I was just gonna mention it. 3) have you worked any on PlayStation 2 games? The creator of Fire Emblem (all praise Kagga!) left Nintendo sometime around Thracia 776 and created his own company and fire emblem games for the PS2. These have never been translated to my knowledge and I don't even know if ps2 patching is even possible. Thanks again for all your hard work along with Projext Nagga Team. Can't wait for the Alpha or Beta whatever is released and obviously can't wait for finished project! Sorry for such a long post. Have a great day! Are you talking about Tear Ring Saga and Berwick Saga? I know that Tear Ring Saga, which is a PS1 title, was translated some time ago and I remember that someone placed a Help Wanted Ad for help hacking Berwick Saga years ago but I don't know if it ever went anywhere. Creating patches for PS2 game is certainly possible and has been done in the past, Front Mission 5 and Dragon Quest 5 being notable examples. I think there is even a Chinese translation patch for Berwick Saga so hopefully someone will eventually create an English translation. Awesome! I knew the first one was being worked on but never found out if it was finished. I'm Hoping to give it a run after my current FE4 play through! Awesome I found it a pity that a rather amusing dialogue was not in the old patch yet haha. Hopefully I didn't cause you too much of a headache with my mention of overlooked dialogue. It wasn't a problem, this is the kind of thing we need reported. It's so easy to overlook missed dialogue, but it needs to be implemented if we want to call this a complete translation. It's going alright. Right now, I'm working on optimizing the different menu screens, since it kind of glitches out for a split-second when displaying text. Some modifications have been made to the title screen and overworld map, and of course, still need to go back over the game's script to finalize it. I have a save file at the end of Chapter 5 with a max-speed Lewyn and Erin, and the game generates Ced's stats when Chapter 6 starts. Though I still can't seem to replicate the overflow bug. The tome should just be acting as an extra bonus on top of his own speed, but the game caps final stats at 30. So I think something had to have happened during the stat generation to make it overflow. I have not worked on any PS2 games yet. The SNES is the most familiar system to me, and I know a bit of the NES and GB architecture. But later on, I hope to learn more about the Playstation systems. All praise be to Shouzou Kaga ! Yes, doing PS2 patches are even more doable now, Thegreathare21, thanks to Kingcom having developed an armips debugger for the PS2 after he did likewise for the PSP platform. It's even been integrated into the PCSX2 emulator as of version 1.4.0 this year! I'm sure you know that Shouzou is doing a free strategy game with a team of volunteers, right? ddtranslation, that would be awesome if you could be able to do a PSX translation. There are so many games in that system left still needing to be translated! It's nice when a romhacker just focuses on one or two projects at a time! Esperknight can do the PSX scene but he's basically been spanning over 10 projects at once, and never being sure of when to finish just one, *sighs. I feel we have a right to complain about that. Because worst case scenario none of these projects may ever be finished nor their source files released publicly! So that is a worry! Also you may wish to ask Nightcrawler for advice on how to make the menus go by speedily with no glitches as he does have experience in that regard. I saw that! Vestaria Saga or something liked that. Looks great so far. I'm really glad Kaga (praise him) is making another game in the style of FE 1-5. In my opinion it already looks better than awakening/fates. Next to Project Naga that is my most anticipated game. I definitely agree on that. I think when most current translators are finished on their projects that I believe focus should be somewhat shifted to the PSX scene. It's been left neglected for years, and that one guy doing the Tales games looks like might need some help. Any update about the unused stuff yet? I haven't looked into it yet, but since all the work with the menus is done, I should start on that next. I've basically just been passing the time catching up on some gaming, and time flew by. I'll start as soon as I get back home after the weekend. I was impressed with your work at Kyuuyaku Megami Tensei and Romancing SaGa, so I'll definitely be playing this. The last Fire Emblem I played was the NES version of the first game, so every other game will probably appear modern to me. Anyway, great work so far, I'm looking forward to the finished product. I tried running a simple scan based on the most common pattern of dialogue in the game, and found a couple that I don't recognize. They mostly seem to be focused on the Prologue. 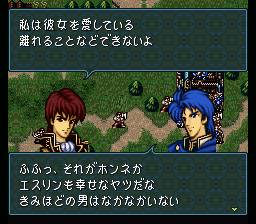 One's between Alec and Ethlyn, where he seems to be concerned about her getting dragged into the war with Verdane. The second is Midir and Azel discussing Aideen's capture and their feelings for her. And the third is Noish and Alec talking about their duties as Sigurd's knights. 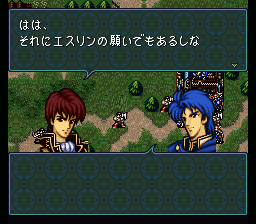 I'll see if I can find any more, like the one that you mentioned about Sigurd and Quan talking. Looking good! I was wondering if anyone was using the editor besides me. I mean this conversation, they start talking about Ethrin after the normal conversation about the Barhara academy, Eltoshan and their dream. Oh, I see it now. That text didn't even have a pointer to it. It was just sitting right after the previous conversation. I did a quick scan of things that have the standard dialogue tags, but weren't pointed to, and found a couple new ones. The rest looked like duplicates. Oh my gosh . 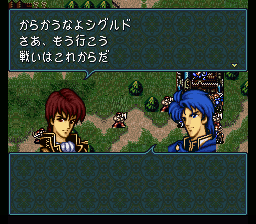 The translation nearly finished (maybe), every FE fans get so hyped when the final product is finished . Esperknight can do the PSX scene but he's basically been spanning over 10 projects at once, and never being sure of when to finish just one, *sighs. I feel we have a right to complain about that. Because worst case scenario none of these projects may ever be finished nor their source files released publicly! So that is a worry! Of course, you can complain! Moreover - feel free, I say!